We've made it to the final post of Our Denver Apartment series! 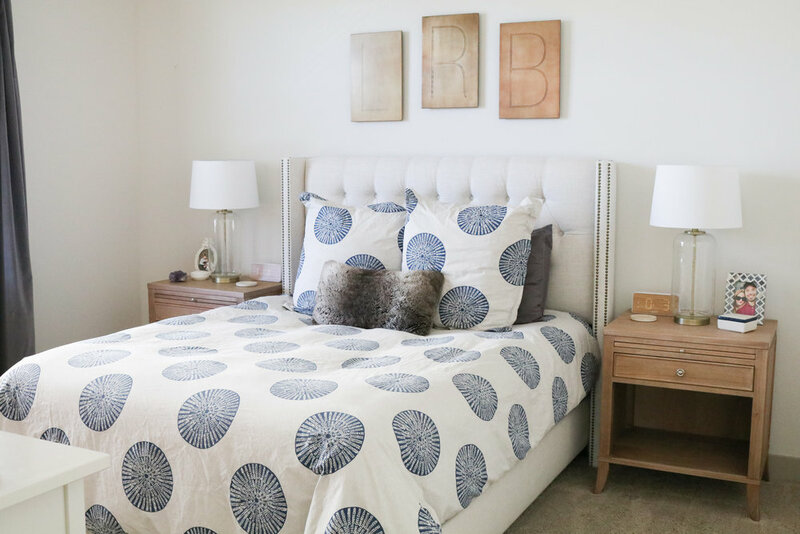 Today I'll be showing you our bedroom, one of my favorite spaces in the entire apartment...mostly because I'd like to spend all day in bed watching Netflix. Currently, we have our bedroom somewhat set up in our rental home but no personalization has occurred because painters are coming on the 9th. I've said it before in a post but this move has been far more stressful than I had anticipated and the reason why I've been so quiet here on the blog. I do not handle stress well and I'm desperate to nail down a routine to help balance me out, but that probably won't come for a few more weeks as we await painting and the floors being replaced. So I'm going to apologize in advance if March posts are a bit sporadic (also, is anyone else floored that it's already March?!). Enough of my rambles, let's get to the photos! One thing I love about our room is our bed. When I got married I knew I wanted an upholstered tufted bed, because I just love how cozy they look. While I love to shop for home decor, I prefer to shop in person than online because you never really know what you are getting until the box arrives. It took me over 4 months to find a bed online the wasn't an arm and a leg but also had enough good reviews that I felt confident in my purchase. We found this bed on Wayfair (I liked the most similar bed I could find) and my only gripe with it is that the headboard is a bit wobbly due to the manufacturer not making it a bit wider for the bed frame to attach seamlessly, but I still really enjoy it and it's not too hard to take apart and put back together. Our nightstands are another purchase that took awhile for me to decide on. We found these gems during a sale at Arhaus (they are on sale right now!!) and I'm obsessed with them! They are so beautiful and extremely sturdy. Not sure how I want to style the big open space (baskets, books, what would you do? ), but even open and bare I still love the look. Our duvet, comforter, and shams are from The Company Store (on sale now!! ), which I can't recommend enough! They have an amazing selection and have a great reputation. The women of my family have shopped from them for years, so turning the TCS for my own home purchases was a no brainer. Our sheets and pillowcases are from Parachute Home and we have the Percale sheets in slate. Parachute Home is a bit of a splurge but they are well worth the cost and their customer service is unparalleled. For example, one of my fitted sheets had some micro-tears in it and I contacted Parachute for some help and with no questions asked they sent me a new fitted sheet for free and sent it next day shipping!! Seriously, if you are looking for new sheets you need to try out Parachute. I am not a DIY-er at all and in all honesty I think most DIY projects look like they are DIY projects (lol), but I did do one DIY for this room. We picked up this dresser from Ikea (this thing is a realllll pain to put together, btw) and it came with these ugly round black knobs. I really hated how Ikea-y it looked and decided I'd just change out the knobs to make it look a little more high end. While at Ikea I grabbed some more modern knobs, a can of brass spray paint at Joanns, and headed home to makeover this dresser. If you have any Ikea furniture you'd like to give a face lift too switching out the knobs is a great and cost-effective option. All the items on top of the dresser are either Home Goods, World Market, or Target finds. A fun fact about me is that I love to collect vintage makeup. I started my collection after reading Lisa Eldrige's book Face Paint: The Story of Makeup. If you don't know who Lisa is, she's the global creative director of Lancome and makeup artist to the stars, most notably Kate Winslet. Lisa has been collecting makeup for years and researched the history of makeup for her book. The history of brands and their products really intrigued me the most and since then I've been collecting and researching different products I've found at thrift stores or vintage fairs. To note: I know Tums aren't makeup but I picked these up because they made me think of my Dad who ALWAYS has Tums with him. I wish Tums would bring back these adorable little tins because they are way cuter than their current packaging. Well there you have it folks! You can look forward to some more home posts in the future. I'm really look forward to having an outdoor patio space to decorate and Brett can't wait to start BBQing, maybe even one of these days I'll pop up one of Brett's recipes. I hope you all have a fabulous weekend and if you are in Southern California stay dry from all this rain!